When I went to Northeastern University in Boston, I walked all around the city. Because I worked my way through college, money was scarce and I never had enough. I didn’t do lunches out, shopping expeditions, or ski trips on the weekend. Subway fare was money that could be better spent on more important things so, unless I was on a date, I hoofed it pretty much everywhere I went. Having come from a small town, I enjoyed cruising around Boston’s streets. Just looking at things int he big city was exciting, especially the way Boston was growing up and out. I made my way from place to place, I sometimes encountered the Popcorn Man. He was an old guy, thin with a face as gnarled and twisted as a ginseng root. Who knows how old he really was: back then people often looked 10 or 20 years beyond their chronological age. Living through a World War and a Great Depression will do that to you. 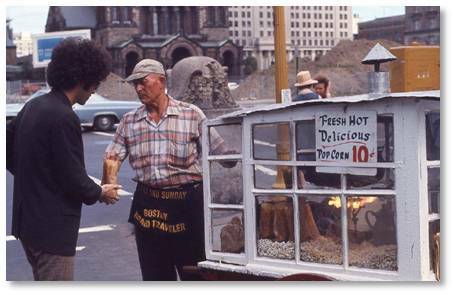 The Popcorn Man’s usual stand was at the corner of Arlington and Boylston streets near where the Mr. Frosty now truck hangs out in the summer. Sometimes he worked Copley Square or Downtown Crossing at the intersection of Macy’s and Filene’s. And he was out in all kinds of weather—rain, snow, wind; it didn’t matter to him. I don’t remember an umbrella. People were tougher back then, too.The flame on his gas lamp always made a cheery glow. Last week I found an archive photo of the Popcorn Man. I swear I have searched before in many places with no luck but on Saturday morning something appeared from the Boston Globe archives. There he was, with his cart, filling the tank that powered his popping machine from a gas station on Columbus Avenue. To say that the Popcorn Man’s product was fresh popped is an understatement. He made it frequently in the same kind of pan that machines use today, tipping the latest batch into the cart. Above the fluffy white drifts, real butter melted and warmed in a battered tin teapot that hung above an open flame. (Think about working with a gas tank and an open flame!) Not for him the artificial orange grease that movie theaters mislabel as butter. This stuff was rich and golden and fragrant. There were lots of burned kernels but I didn’t care—the pigeons got those. At 10 cents a bag, his popcorn was an affordable luxury that I indulged in whenever I encountered him. At 110 pounds soaking wet, I could also indulge in the melted butter without guilt. 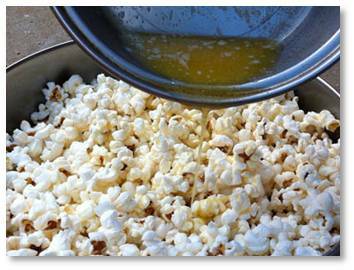 The Popcorn Man would fill a paper bag and then pour warm butter over it from the old teapot. The butter would make grease stains on the bag and it got all over my hands but I would walk happily down the street, munching my way back to the dorm. I graduated Northeastern and moved to New York for three years. 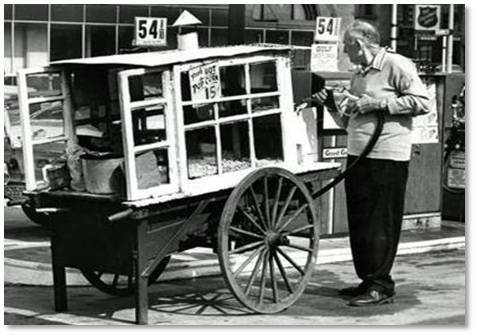 The Popcorn Man was still in business when I returned, as the dated photo attests, and the popcorn had risen to 15 cents a bag. (Gasoline, as you can see, was 54 cents a gallon.) But I was busy with my career and the demands of a family and I only went into the city now and then. Sometime in the decades between that time and when I became a docent for Boston By Foot, the Popcorn Man vanished from Boston’s streets. I have no idea who the Popcorn Man was or what his name was. I don’t know why he sold popcorn on the streets. He lived through a difficult period in history, though. Back then, with no safety net, people did whatever they had to do to put dinner on the table. He might have loved being a street vendor or he may have hated it. Perhaps today, he would run a trendy food truck on the Greenway. Whatever, he did what he needed to do. The Popcorn Man is one of my fondest memories of my student days in Boston. I always felt a connection to him, possibly because I love popcorn and looked forward to seeing his cart. The city is poorer without him. Still, he had to have been somebody’s father, uncle, brother, son, cousin or husband. If anyone knows who the Popcorn Man was or where he came from, please let me know. I would be happy to learn and write more about him.